Tile and grout can be notoriously difficult to clean, right? No matter how much you scrub or how much of that powerful household cleaner you use, it’s extremely difficult to eliminate all of the built up dirt, grease and grime that quickly collects and hardens within tile pours and grout lines over time. With some help from Extremely Clean Carpet Cleaning, you won’t have to struggle with manual cleaning for long. The team at Extremely Clean does the opposite of manual cleaning; we utilize the industry’s most powerful equipment to completely blast away grease, dirt, bacteria and all kinds of grime that builds up within grout lines. This truck-mounted machinery combines a high pressure rinse with a specialized heated solution to take your tile and grout to a new level of clean. If you’re tired of cleaning tile grout on your hands and knees the manual way, let Extremely Clean’s team of professional grout cleaners do the hard work for you. Our heavy-duty, powerful grout cleaning machine will blast away tough-to-handle mildew, bacteria and mold that builds up in tile pores and grout lines. In bathrooms, kitchens or outdoor patios, our professional Orange County team will deep clean tile and grout until it’s stain-free and sparkling. Instead of replacing tile and grout when damaged or covered with built-up dirt and grime, why not invest in regular professional cleanings once every 12 months? Whether we’re blasting away dirt, stains or bacteria, you can be sure of one thing: our Orange County based technicians are certified to do so safely and effectively. An organization called the IICRC – the Institute of Inspection Cleaning and Restoration Certification – ensures that companies like Extremely Clean Orange County know exactly what we’re doing when we work in your home. The IICRC is a non-profit organization that leads the professional cleaning industry in terms of defining best practices to follow. By enrolling in interactive, hands-on training and certification programs designed by the IICRC, our Orange County technicians not only learn the industry’s tried and tested techniques to clean tile and grout; they also prove their skill set by passing certification exams that test their knowledge and commitment to producing results. Producing results is the name of the game for Extremely Clean Orange County. And we prove this by upholding our 100% satisfaction guarantee with every single service. Feel a little unsure about how clean your tile and grout looks when we’re finished with our service? Please let us know so we can reclean it right away. Not satisfied with the recleaning? No worries – we’ll give you a full refund. Should any item experience any sort of accidental damage while we clean your tile and grout, we’ll assume full responsibility for repairs. And if repair isn’t a route that’s worth pursuing, we’ll rectify the problem; we’ll simply give you a cash credit that you can then use to purchase a replacement. Is it time to gaze at super clean, super healthy tile and grout in your home? 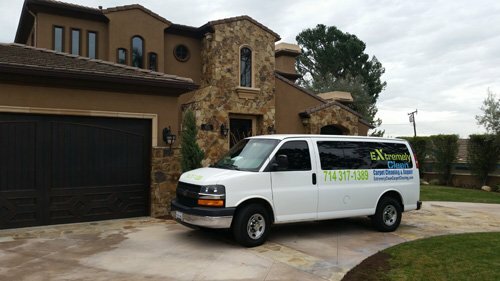 Give Extremely Clean Orange County a call today and let us make it happen!